Because many pet shops fail to provide proper care to animals and often sell sick and malnourished animals. Why support a corporate industry that encourages the breeding and sale of animals there are already too many of? Those who breed millions of rabbits each year for profit are contributing to the companion animal overpopulation crisis. Every newborn bunny means one home fewer for a rabbit desperately waiting in a shelter or roaming the streets. Help us stop this vicious cycle. The primary purpose of rabbit rescue organizations is to match the characteristics of a rabbit that is known to them with homes that are appropriate so that the adoption is a positive experience for the rabbit and the adopters. The primary purpose of breeders and pet stores who sell rabbits is to make a profit from selling the rabbits. They are not likely to be personally familiar with an individual rabbit. 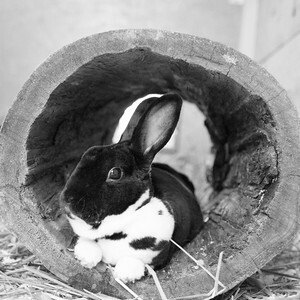 You are not likely to get good information from them about caring for companion rabbits. To purchase a rabbit is to condemn an equally wonderful rabbit to death and to reward people for breeding and selling rabbits for profit. This only increases the homeless rabbit population. Please do not participate in this cruelty. 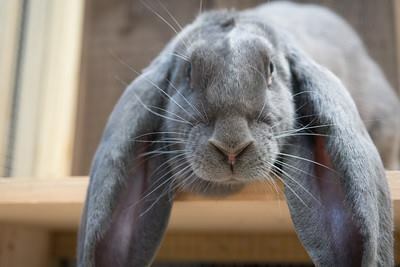 rabbit rescues, shelters, and welfare organizations are very knowledgeable about their charges and can answer the questions you may have about rabbits in general or about an individual rabbit. In addition, most take responsibility for spaying or neutering their rabbits (which can run in the hundreds), training them to use a litter box, socializing them and correcting behavioral problems. Volunteers in the group most often can discuss with you an individual rabbit's quirks, can advise you if a rabbit will adjust to children and/or other household companion animals, their food preferences, and their general temperament. This means that you can get lots of great help before you make a decision about the rabbit that you are interested in and thereby avoid potential pitfalls. These organizations are motivated by what is in the best interest of rabbits, their health, and their longevity. They keep up on the latest veterinary literature, often have consulting rabbit veterinarians, and know which products are best for your rabbit. All this adds up to a better chance for you and your rabbit to live happily and healthily together and decreases the chances of yet another rabbit ending up abandoned and homeless. Please contact us for more information. These are very special babies who deserve a forever home. Hard work has gone into rescuing & rehabilitating - both physically & socially. Remember to "Like" us on our Facebook Page for updated "Available to Adopt" buns!